RBC Architecture in Mâcon has been selected to handle this ambitious project. The 12-strong team from RBC takes an overarching conceptual, technical, and economic approach to architecture with a keen eye for detail. The team is determined to take a contemporary approach, and will be bringing all its experience and architectural and urban expertise to this project. An in-depth search for appropriate solutions will allow the contracting authorities to opt for sustainable constructions to optimize functionality and quality. RBC Architecture’s project involves making a clean break with what is already there by designing a building that has a powerful symbol that is clearly visible from the avenue. A single-entry building comprising curved shapes that is easily identifiable by visitors. The exterior shape of this extension will take its inspiration from a wooden wine press. A combination of strength and curves will wrap around and unite the existing façades. This 17-meter-high totem will be an attraction in itself, with a viewing platform offering exceptional panoramas over the River Saône and part of the town. The curved shapes inspired by ammonites, those fossils frequently found in the region’s clay-limestone soil, will contain a singly entry point that will connect the two existing buildings. The curves will break the rigor and linearity of the existing façades. The interior spaces and different functional areas demanded by the project will be arranged in a star shape around a central axis. The path from this new entrance will be fluid so that visitors can enjoy a unique and convivial experience through the Cité and the tastings on offer. 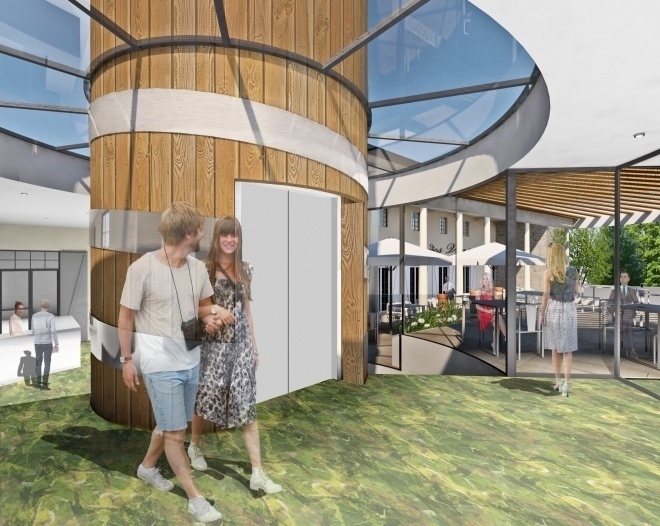 The boutique will act like a window onto the forecourt, and will have an outside terrace where visitors can enjoy a tasting with views over the river. Fluidity, transparency, openness, and light will guide the architectural approach to the Cité in Mâcon. The presence of a glass façade and a glass roof at the top of the central staircase will contrast with the stone and mineral qualities of the existing buildings. The glass will bring transparency without adding any weight to the façade. The building will be like a showcase that is open, light-filled, and welcoming on the outside, but also in terms of the spaces between each element, which will be fluid and open for better flow. Pergolas made from strips of wood and metal will protect visitors from the midday sun, and brise-soleils will filter the morning sun without blocking out the view of the Saône. Inside, the materials will be noble ones with a connection to the world of wine, such as wood, Bourgogne stone, glass, metal, and zinc. The building will become a gateway to discovering the wines of the Bourgogne region, an ambassador for the region and the symbol of a city.